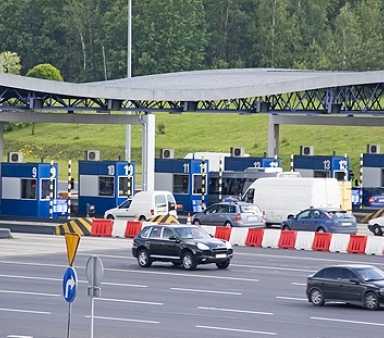 We inform that on July 20th, electronic toll collection system A4Go was launched on the A4 motorway Katowice-Krakow. Onboard devices A4Go together with impulse packages can be purchased at Customer Service Points at Toll Plazas, as well as online at www.karta4go.pl. possibility to raise professional qualifications through training. We have been looking for people working both full and part time as well as at weekends. 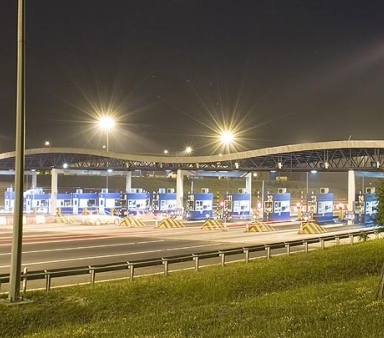 Dedicated, outmost left lanes at Toll Plazas in Brzeczkowice and Balice are designed for drivers of vehicles that use electronic toll collection system A4Go. We kindly ask drivers paying in other forms to select remaining lanes. 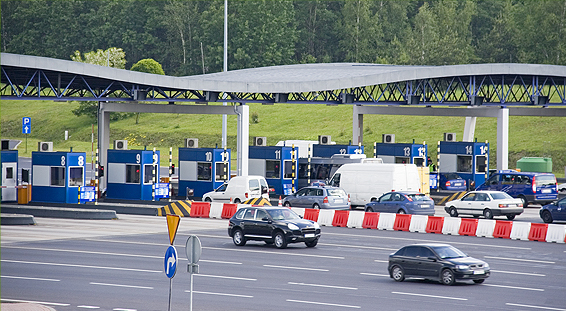 On the A4 motorway, it is not possible to pay with viaToll system, using viaBox or viaAuto. the Management Board of VIA4 S.A. decided to implement the Quality Management System meeting the requirements of ISO 9001:2008. 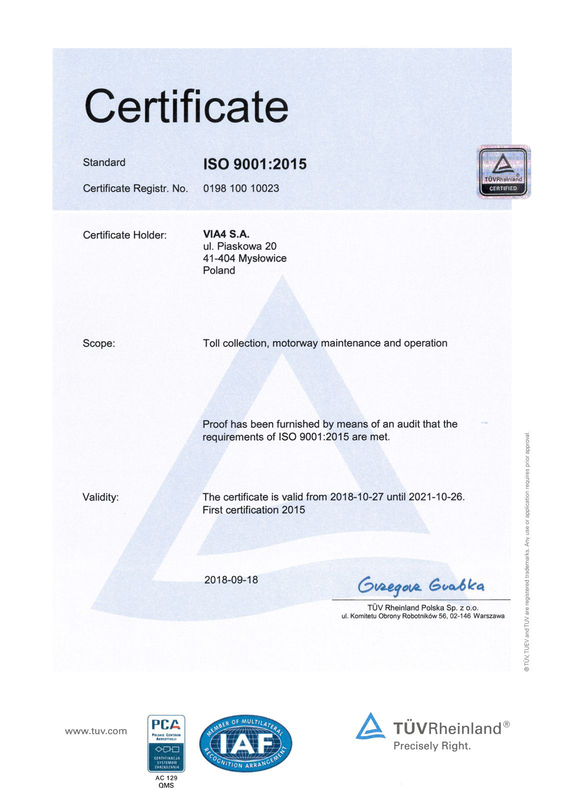 In September 2015, a certification audit was conducted by the auditors of TÜV Rheinland Polska Sp. z o.o. in all organisational units of VIA4 S.A. 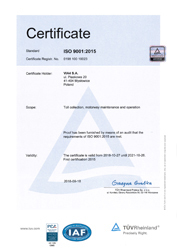 The audit confirmed that the implemented Quality Management System meets the requirements of ISO 9001:2008. 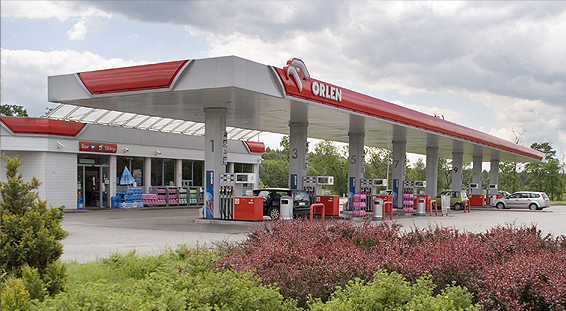 On 27 October 2015, TÜV Rheinland Polska Sp. z o.o. granted a certificate confirming that VIA4 S.A. applies the Quality Management System in accordance with the above-mentioned ISO standard. 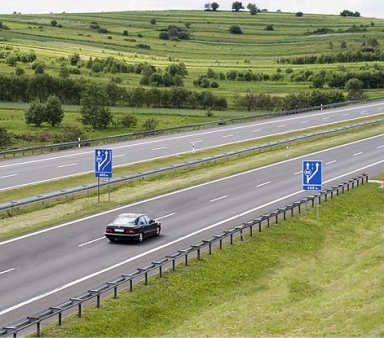 From km 366+800 to km 367+200 in the Krakow direction, emergency lane is closed (construction of acoustic barrier construction). On the Balin junction, Katowice/Balin slip road is closed. There is a detour through Chrzanow junction (road surface replacement). From km 380+920 to km 381+750 in the Krakow direction, emergency lane and part of right lane are closed. 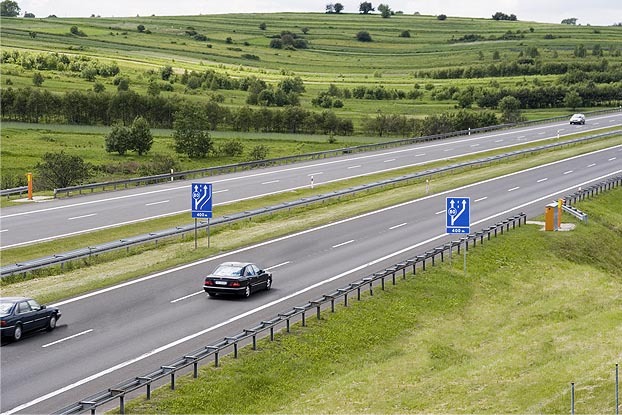 Vehicles movement takes place through two narrowed lanes (acoustic barrier construction). 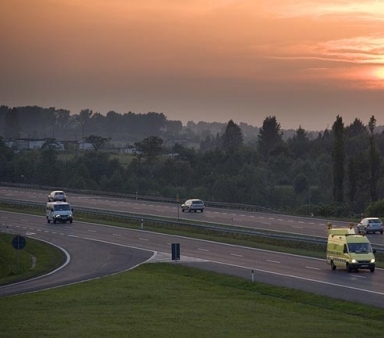 From km 388+600 to km 389+700 in the Krakow direction, left lane is closed. Vehicles movement takes place through emergency lane and right lane (bridge renovation). From km 389+700 to km 389+000 in the Katowice direction, left lane and right lane are closed. Vehicles movement takes place through dividing strip of the bridge and left lane of opposite road (bridge renovation). 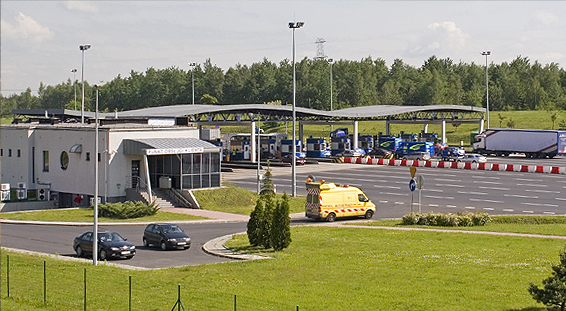 The Company was established in 1998 to provide operation and maintenance services of toll section of Katowice-Krakow A4 motorway and was operating under the name of Stalexport Transroute Autostrada S.A.
From the beginning of the existence we are a part of capital group of a company listed on the Warsaw Stock Exchange, i.e. 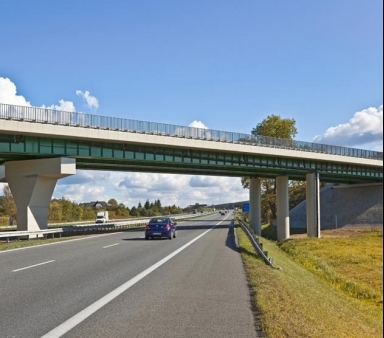 Stalexport Autostrady S.A. 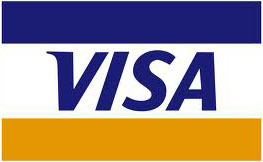 In February 2012 the name of the Company was changed to VIA4 S.A. The Company offers highest quality of services based on the requirements of ISO 9001: 2015. 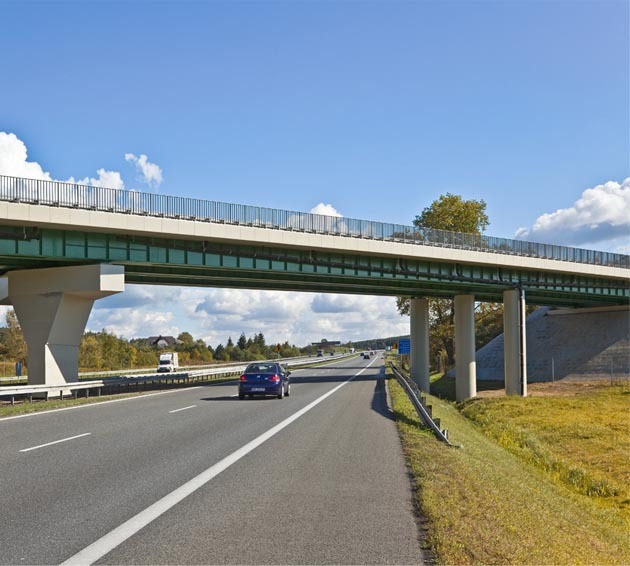 In September 2015, the Company implemented Quality Management System and after an audit carried out by TUV Rheinland Polska Sp. z o.o. received the ISO 9001: 2008 certificate. On September 18, 2018, the Company was once again certified with ISO 9001: 2015.
office in Luxembourg - 55% of company shares. The majority shareholder of Stalexport Autostrady S.A.
Paris, France - 45% of company shares. 2. Ethic Officer, Atlantia S.p.A., Via Antonio Nibby, 20 -00161 Rome. The violation, or suspected violation, of Anticorruption Policy should be reported immediately to the competent Supervisory Board with a copy to the Anticorruption Officer by using the dedicated e-mail address antykorupcja@via4.pl or by sending a letter to the following address: Rzecznik ds. Polityki Antykorupcyjnej, VIA4 S.A. ul. Piaskowa 20, 41-404 Mysłowice. 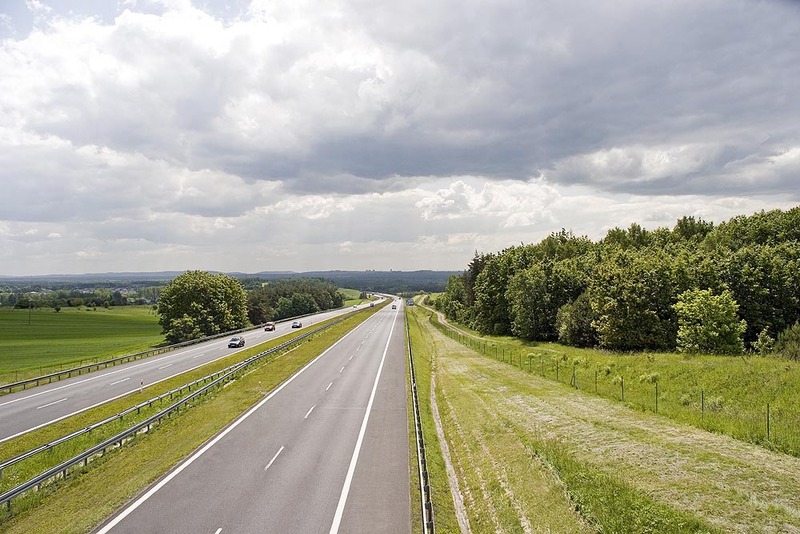 In this part we provide a handful of rules for you, which application will allow a safe and comfortable use of the motorway. 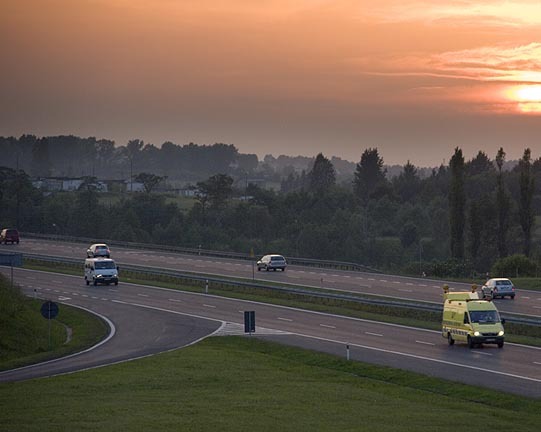 We have based these rules on the analysis of accidents on the motorway and on a visual assessment of day-to-day drivers behaviour..
We have divided them into four groups. ‘Frequent driver mistakes’ are presented here. 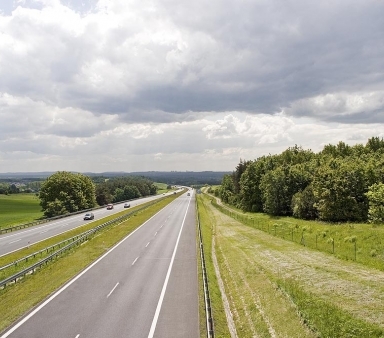 do not drive ‘bumper-to-bumper’ - driving at a speed of 140 km/h we travel nearly 40 m during 1 second. 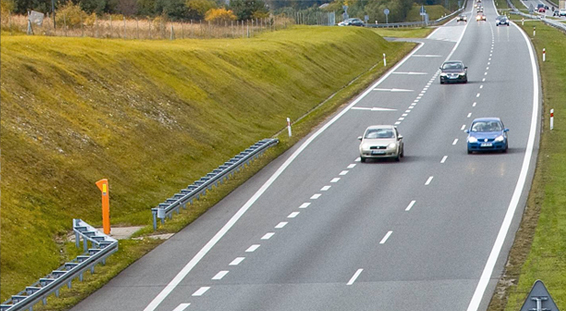 do not cut in on other vehicles - differences in vehicle speeds on the motorway happen to be very large. We have based these rules on the analysis of accidents on the motorway and on a visual assessment of day-to-day drivers behaviour. We have divided them into four groups. In this part the advice ‘when you drive’. 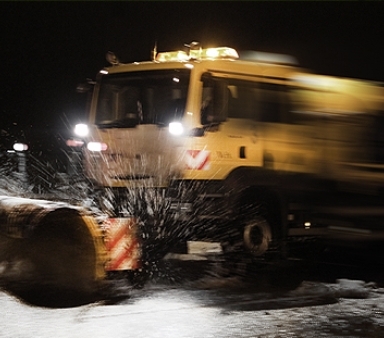 avoid overtaking winter maintenance vehicles in action, i.e. We have divided them into four groups. 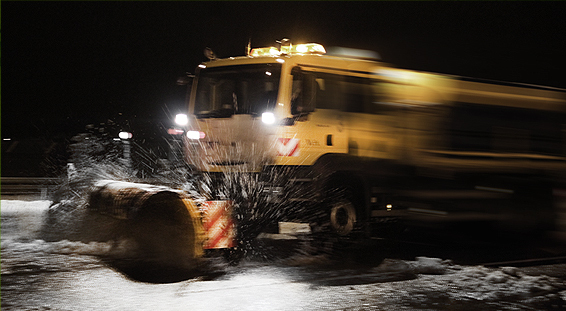 Our advice, if you are forced to stop on the motorway. 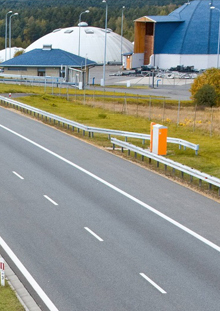 Also on toll plazas (TP) various incidents occur, including collisions. To facilitate yourself and the others passing the TP we warmly advise using the following rules. half on the Balice TP). Bank and fleet cards are accepted at all lanes. with 9 or 10 lanes each direction. Centre at +48 32 762 73 33. (SA), 2 on each motorway side. Zastawie, Kępnica and Morawica SAs. I give my consent to the processing of my personal data contained in the contact form in order to its handling by VIA4 S.A. with its seat in Mysłowice, ul. Piaskowa 20. In accordance with Art. 6 sec 1a) of the General Data Protection Regulation of 27 April 2016 (EU Journal of Laws L 119 of 04.05.2016), by filling in this contact form, I give my consent to the processing of personal data contained herein in order to receive an answer to my question asked hereby or have my issue resolved. 1. 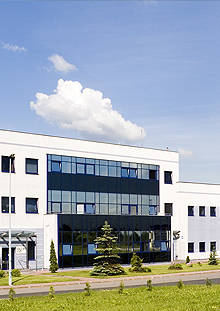 The Data Protection Controller of your personal data is VIA 4 S.A., 41-404 Mysłowice, ul. Piaskowa 20. 2. Contact with the Data Protection Officer – by mail: iod@via4.pl. ul. Piaskowa 20, under Art. 6 sec 1a) of the General Data Protection Regulation of 27 April 2016 for the purpose of answering your question or resolving your issue. 4. Your personal data will be stored for the time necessary to answer to your question or resolve your issue. 5. You have the right to request the Data Protection Controller to grant you the access to your personal data and to rectify, remove and limit their processing, as well as to withdraw the consent for the data being processed. 6. You have the right to bring a complaint to a supervisory authority. 7. Providing personal data is voluntary; however, failure to provide them in the extent requested by the Data Protection Controller shall result in the inability to answer your question of resolve your issue. To make the website more useful and functional, we use the information recorded by means of cookies. The use of service is equivalent to user’s agreement on their application.